The G7 summit has ended in acrimony, with US President Donald Trump lashing out at host Canada and retracting his endorsement of the joint statement. 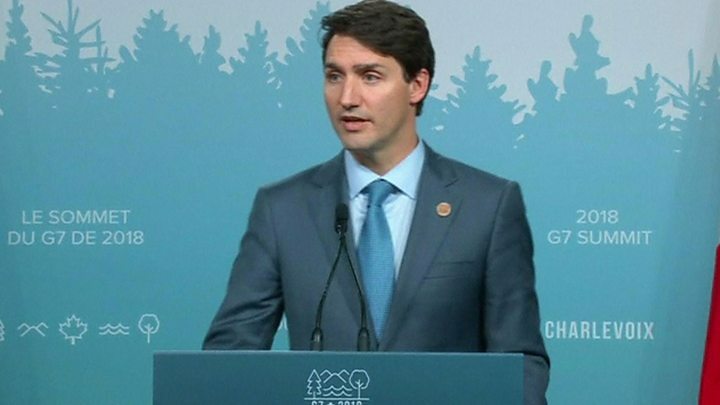 He accused Canadian Prime Minister Justin Trudeau of acting "meek and mild" during meetings, only to attack the US at a news conference. The summit was dominated by disagreements, notably over trade. Mr Trudeau described as "insulting" Mr Trump's decision to invoke national security to justify tariffs. How did the spat unfold? Differences over the recent US tariffs on steel and aluminium imports had seemed to have been papered over in a joint communique that advocated a "rules-based trading system". 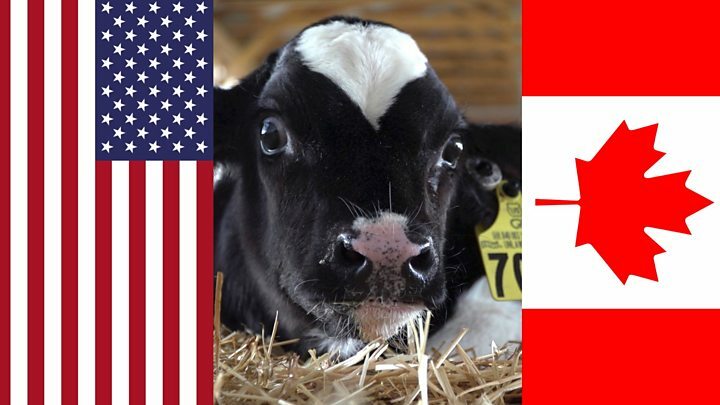 But in a news conference afterwards, the Canadian leader vowed to press ahead with retaliatory tariffs against the US on 1 July. Tweeting en route to his next summit in Singapore, Mr Trump said he had instructed US officials "not to endorse the communique as we look at tariffs on automobiles". He suggested Mr Trudeau was "very dishonest and weak". Mr Trudeau's office responded by saying the prime minister had said nothing he had not said before, both in public and in private conversations with Mr Trump. Until just a few weeks ago, the relationship between Mr Trump and Mr Trudeau could have been called cordial. Despite differences between the two countries over trade - over everything from lumber to the major renegotiation of the North American Free Trade Agreement - the two men tended to speak positively about each other. The recent US decision to impose metals tariffs on Canada, the EU, and Mexico was a turning point. Mr Trudeau began using a much harsher tone. Polls indicate Canadians support the tougher stance. The fact remains that the two economies are deeply integrated, with jobs on both sides of the border counting on smooth trade. Whether or not this new phase in the Canada-US relationship will allow some of the trade sticking points to be resolved is still to be seen. The G7 summit, held in La Malbaie, Quebec province, also covered such issues as relations with Russia. In the communique, the group of major industrial nations - Canada, the US, the UK, France, Italy, Japan and Germany - had initially agreed on the need for "free, fair, and mutually beneficial trade" and the importance of fighting protectionism. On 1 June, the US imposed a 25% tariff for steel and 10% for aluminium on imports from the EU, Canada, and Mexico. Mr Trump said the move would protect domestic producers that were vital to US security. The EU then announced tariffs on US goods ranging from Harley-Davidson motorcycles to bourbon. Canada and Mexico are also taking action in retaliation.